Many people consider spaghetti or pasta as the ultimate comfort food. 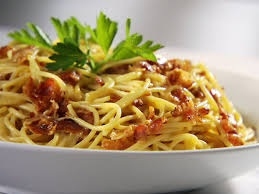 Many Italians eat spaghetti at least once in a day and feel incomplete without it. 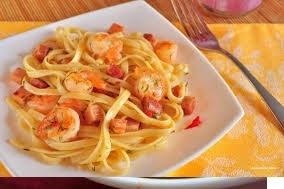 Pasta is a favorite meal for people who are caught up in the fast-faced life. The meal is enjoyed in gourmets and at family tables in all parts of the world. Here are a few recipes for anyone who wants to learn how to cook spaghetti. Boil salted water in a large pot and cook spaghetti pasta in it until al dente. Add a tablespoon of olive oil and lay aside. Place the chopped bacon in a large skillet and cook it until slightly crisp. Remove and drain it on paper towels. Set aside 2 tablespoons of bacon fat, add a tablespoon of olive oil in the same skillet and cook onion over medium heat until it is translucent. Add garlic and cook for a minute. You can add white wine and cook for a minute if desired. Place the cooked bacon back into the pan and add drained spaghetti. Heat and toss thoroughly to coat the spaghetti. You can add a little oil if the mixture is dry or sticky. Add beaten eggs and keep tossing constantly using a large fork or tongs. Cook until eggs are almost ready and then add half a cup of Parmesan cheese and continue tossing. Add pepper and salt to taste. 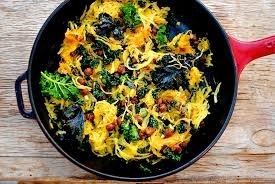 Sprinkle chopped parsley and serve immediately. Add extra Parmesan cheese while serving. To make the sauce, pour the olive oil in a large saucepan, warm under medium heat and then add onions. Cook the onions until they are light brown. Add 2 cloves of garlic and cook for a minute. Add the bay leaf, tomato paste, oregano, crushed tomatoes, and water as you stir. Add salt and pepper and allow the mixture to boil before reducing the heat to low. Allow it to simmer as you prepare meatballs. To make meatballs, mix cheese, parsley, bread crumbs, garlic, ground round, oregano, and eggs in a bowl. Season the mixture with pepper and salt. Roll and make balls of about one inch, and add them to the sauce. Cook until the meatballs have an internal temperature of 160°F. Boil salted water in a large pot and then add the spaghetti. Cook them for 8-10 minutes until they are ready and then drain. 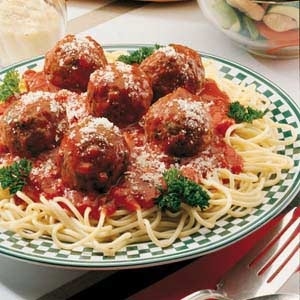 Serve the sauce and meatballs over the spaghetti. Cook the spaghetti as directed on the package. Heat oil over medium-high heat in a large skillet. Add garlic and onion and cook for 5 minutes or until the onions becomes tender. Keep stirring and then add beef. Cook for about 7 minutes or until beef becomes crumbled and loses its pink color. Stir occasionally as you cook then drain. Add pasta sauce as you stir and then cover the sauce. Cook for 10 minutes or until the sauce is hot over medium to low heat. 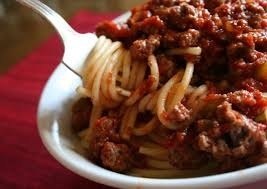 Then top the meat sauce over the drained spaghetti to serve. You can sprinkle cheese if desired. Check the package for instructions on how to cook spaghetti. Reserve ¾ cup of cooking water as you drain the pasta. Then put pasta back to the cooking pot. Place a large skillet over medium to high heat and add the oil, radishes, shrimp, 1/4 teaspoon of pepper and 1/2 teaspoon of salt. Add the sauce, lemon zest, butter, and reserved cooking water to the cooked pasta and then toss to coat. You can add more cooking water if the sauce is sticky. Heat the oven until 400°F. Boil spaghetti as instructed on the package, drain and then return to the cooking pot. Mix panko, coriander, capers, chickpeas, garlic, oil, pepper, and salt on a rimmed baking sheet. Roast for 18 to 22 minutes or until crispy. Combine paste with cilantro, chick peas and lemon juice. Drizzle with oil and serve. Server responsed at: 04/25/2019 4:06 a.m.